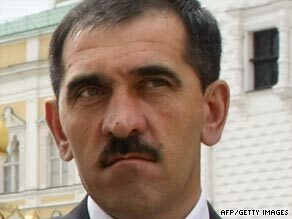 The president of the troubled Russian republic of Ingushetia was wounded in an assassination attempt Monday when a blast hit his convoy. Yunus-Bek Yevkurov suffered a severe brain concussion, fractured ribs and a ruptured liver, his spokesman said. The president underwent surgery and his life was not in danger, spokesman Kaloi Akhigov said. Yevkurov’s motorcade was headed to his office Monday when a suicide bomber detonated explosives packed in a car parked by the side of the road, law enforcement officials told local media. The blast killed Yevkurov’s bodyguard and driver. Three others were seriously wounded. Russian President Dmitry Medvedev called the assassination attempt “a terrorist act.” “He did a lot to restore order and civic peace in Ingushetia and the bandits obviously didn’t like that kind of activity,” Medvedev said on Russian television. Ingushetia is a small Russian republic bordering Chechnya in the North Caucasus, just north of Georgia. An impoverished province of mostly Muslims, Ingushetia has suffered for almost a decade from overflowing unrest in neighboring Chechnya. It is battling a low-level insurgency against Islamist rebels who launch frequent attacks on Russian servicemen and law enforcement officials. In response, Russia has launched a counterinsurgency campaign that has been criticized by human rights group for abuses such as arbitrary detentions and extrajudicial executions.